[Discontinued???] Next up is something that I've always had my eye on, but I have hesitated on because... well, I mean the only excuse I have is the container is a very bright green copper color. I know it's dumb, but it made me hesitate. 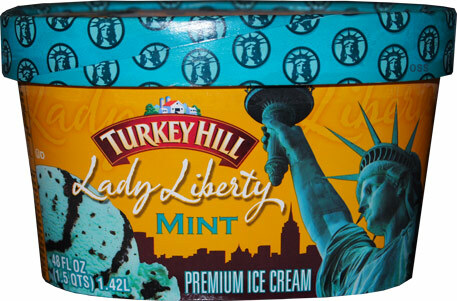 I mean it's cool and all for Lady Liberty to have her own ice cream flavor, but the packaging just doesn't hook me in... ofcourse, that was until I read the description, and I realized I had made a terrible, terrible mistake by waiting. There's only one thing I really need to say about this ice cream... MAN OH MAN how I've missed Turkey Hill's chocolate cookie crunch swirl. They don't break it out often, but when they do, man it's addicting. 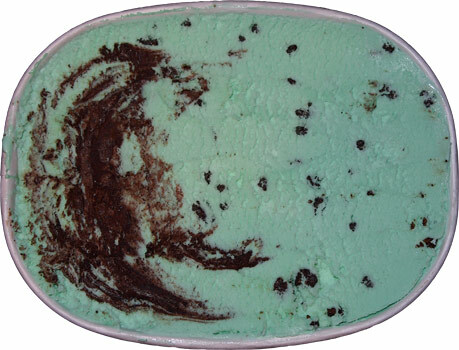 It seems that pretty much every company has some form of thin mint ice cream and so this is Turkey Hill's very chocolaty take on it. The solid crunchy swirl tastes like a real cookie buried in the ice cream, and there are large portions of this container that are layer upon layer of swirl, so you are just buried in cookie flavor. It's hard to not just inhale as you dig and dig and dig for more swirl. If you think about it, what's the competition for this swirl? 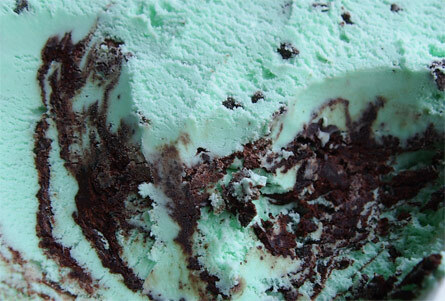 Besides the chocolate cookie swirl in Ben & Jerry's Milk & Cookies, it's rare to find something like this. It's rich, chocolate, and just a joy to eat. In my perfect world, this swirl is in most every flavor. Ok, I tried to force myself to scoop around the swirl and get a good read on the ice cream. It's kind of hard since Turkey Hill has also throw in these neat little chocolate coated bits every. It adds a nice secondary texture here and makes this one even more fun. Mmmm, so much chocolate... right, the mint. It's fine. It's not too potent, it's got that nice cooling effect going on. It's not a real solid ice cream, it's an easy scooper, but it's not gummy so don't worry about that. So, in short, buy this now if you've never tried it. It's a permanent flavor and it's hard to miss. Don't be silly like me and wait way too long to pick this one up. Nice job Turkey Hill. Verdict? Swirl and crunchies for the win!